Listening Post is pleased to announce the signing of The Groove Merchants!The Groove Merchants second studio album, Take It, delivers a hard-hitting punch while simultaneously taking its listeners on a journey that encompasses many different atmospheres. The opening track, Take It If You Want It, kicks off the record with a driving rhythm and a smokin’ horn section, preparing the listener to get on board for a full throttle ride. The albums first single, Hold Your Hand, is more reminiscent of Motown or Otis Redding with shades of The Who. Exploring other territory later in the album, the band gets straight up funky with the near 7 minute jam, The Ride. Ending the record is the adventurous track, Walking Shoes, the band's first studio instrumental. The Groove Merchants continue to drive home and sharpen their familiar turf of breaking point intensity rock while constantly pushing themselves artistically. Formed at Kutztown University in the Fall of 2012, The Groove Merchants are a high-energy blues rock band fueled by Luke Ferracone's unrelentingly soulful lead guitar and singer/rhythm guitarist/percussionist Tye Vallone's powerful voice and energy, which often extends past the stage itself. Bassist John Evin Groome and drummer Anthony Guidotti supply the booming bottom end, laying down precisely what The Groove Merchant's name implies: a fat, solid groove. After some smaller gigs in Kutztown, the quartet began writing and playing out, sharpening their skills in the music buildings of KU, many times to the dismay of late-night security guards. In December of 2014, they began work on their debut, self-titled LP produced, engineered, mixed, and mastered by Glenn Ferracone at The Music Center in Exton, PA. The group released the album in July of 2015 to great success at Steel Stacks in Bethlehem, PA. Since its release, material from the group’s first album and concert reviews have been featured on and received critical acclaim by lehighvalleyunderground.com, theelvee.com, Wang’s World on WCHE 1520 West Chester, and Sound Stage also on WCHE 1520. In the spring of 2015, new addition Dylan Hinnershitz on trumpet, added a funky, unique aspect to the ever-evolving GM sound that will reel in all listeners. A taste of this new GM phase can be heard on the three-track EP, “Live from The Music Centre,” which the band released in February of 2016, showcasing a re-imagining of several songs from the debut GM album, this time featuring Hinnershitz on trumpet. 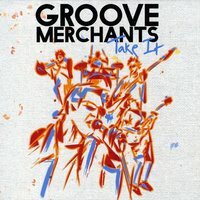 The Groove Merchants much anticipated second studio release, Take It, is now out and available for purchase. If a blast of rock driven, funky, blues filled energy is what you need, look no further.